Benjamin Mendy is currently recovering from another lengthy injury after undergoing knee surgery in November, with his expected return date around February. The 24-year-old left-back has been hampered by injuries since his £52 million arrival from Monaco in 2017, managing just 18 appearances in all competitions in one-and-a-half seasons. The latest setback was particularly frustrating for the Parisien, as he had clocked up 5 assists in 9 Premier League appearances. Prior to his injury, there was a report of Mendy being banned from the first-team set-up for a week by Pep Guardiola for being late, leading to speculation that the popular World Cup winner could face the axe next summer. 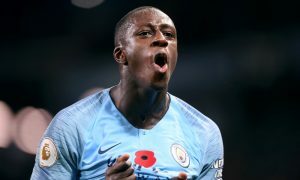 In an interview with Canal Football Club on Sunday night, Mendy played down talk of problems between himself and Pep, on the contrary stating that they have a good relationship. Mendy won both the Premier League and World Cup last season despite his limited appearances, but one trophy eludes him – and City – and he wants it. City will hope when Mendy returns to action, it will be for the long term, with Pep Guardiola having to rotate converted left-backs Fabian Delph and Oleksandr Zinchenko in his absence.